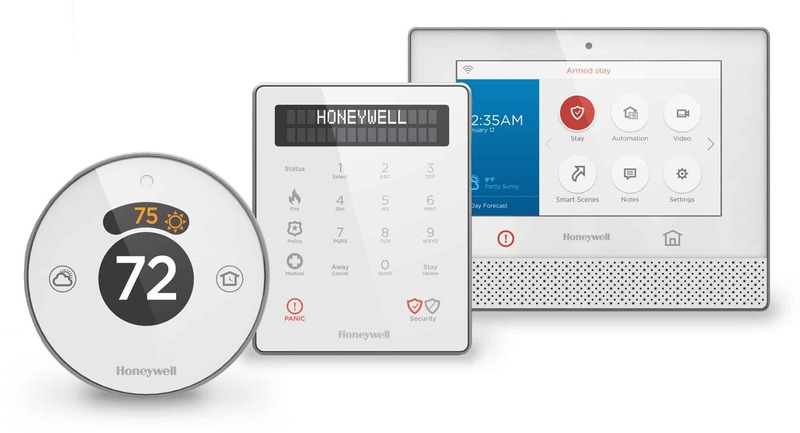 The Lyric is meant to be Honeywell’s attempt at a true competitor with the Nest. At first glance, it appears it might be able to give the Nest a run for its money. However, a deeper look reveals a number of weaknesses. While the Lyric has certainly succeeded in imitating the look and feel of the Nest, it leaves much to be desired in terms of function. Related: How Does Lyric Stack Up Against The Competition? 3 Will Lyric Work For Me? Right out of the box, the sleek modern look doesn’t seem to quite match up with the thin, flimsy plastic that the unit is constructed of. Once it is mounted to the wall, it protrudes in such a way that seems to invite things to get snagged on it while walking by. It only sticks out about an inch, so as long as you’re not dragging your shoulder on the wall while you walk, it should be fine. The screen is clear and simple, but small. There is very little that can actually be done from the screen on the thermostat, so I suppose it isn’t really necessary for it to be any bigger than it is. About the only adjustment that can be made from the unit is to turn the heat up or down and that does not even require the screen. Instead, the outer ring of the thermostat can be turned just like the old-time mechanical thermostats that Honeywell became famous for. What are Shortcuts and Triggers? 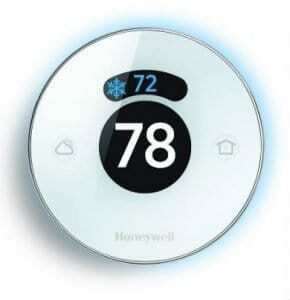 Honeywell uses a somewhat unconventional style for programming your thermostat. It involves the user creating a set of rules for the thermostat. Each time you want the thermostat to change temperature settings, there has to be a “shortcut” that gets “triggered”. You will have to use the mobile app to create the shortcuts and triggers because there is no web interface. It isn’t terribly difficult and it is fairly intuitive, but it certainly takes more thought than just having a weekly schedule in front of you and filling it in. In case you are curious about how the shortcut/trigger interface looks and works, Honeywell has created a short video which I have linked to here: for Android or for iOS. Does Lyric Support Humidity Control? The thermostat does have an indoor humidity sensor integrated into the unit. If you have a whole house humidifier or dehumidifier, Lyric can control it. It can also use your air conditioner as a dehumidifier. This feature could be useful for people in cool but humid climates where the air conditioner doesn’t normally run very often. If the humidity gets too high, Lyric could turn on the air conditioner for a brief period to remove moisture from the air. Can I Control My Fan With Lyric? Personally, I would prefer more control with the circulate setting, but I guess it’s better than no option at all. For those people that are more technically adventurous, it is possible to get more precise control using the shortcuts and triggers. 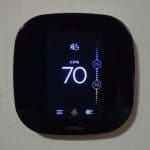 Take a look at my review of the Ecobee3 if you’re looking for a thermostat with more precise control. What Is Smart Response/Adaptive Recovery? Being a smart thermostat is all about optimization. 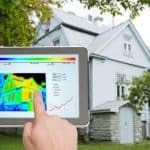 The system will use past performance and current weather data to calculate how long it will take to heat or cool your home. By knowing exactly when to turn on the HVAC system in order to reach your desired set point at the correct time, it saves you money on energy bills yet still makes sure your comfort is a priority. The main selling point of Lyric is its geofencing feature. 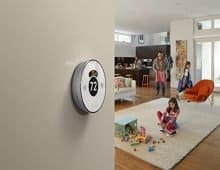 It is currently the only thermostat among its closest competitors that supports this feature without using any third-party apps. This feature uses the GPS in your mobile phone to tell Lyric when you are not home. It switches the thermostat to “Away” mode once you and your smartphone cross a certain distance threshold. When you come home and cross the geofencing threshold distance, the Lyric switches “Away” mode off and cools or heats the house to the temperature you prefer when you’re home so you won’t have to adjust it upon arrival yourself – it’ll already be as hot or cool as you like it when you step in the door. I am one of those people that don’t really have a set schedule during the day, so any type of “schedule learning algorithm” wouldn’t be very useful for me. However, the further I go from home, the longer I tend to be gone so a geofencing feature fits my habits perfectly. In theory, it’s a great feature. But, the implementation with Lyric leaves a lot to be desired. The main problem is caused by how your smartphone tells the thermostat that you are either inside or outside your threshold boundary. It doesn’t! Your phone only sends a message to Lyric when it crosses the threshold boundary. So, if for any reason the “hey, I just crossed the threshold” message doesn’t get through, you are out of luck. Lyric will continue working in whatever mode it was in previously. The app won’t realize the message didn’t get through and so it won’t try to send it again. You are on a cellular network that does not support simultaneous voice and data. If you happen to be talking on your phone (using voice) at the moment you cross the threshold, the message will not get sent because it requires using data transmission. Lyric doesn’t have a good connection to the home router. We live in a world with plenty of products that have no problem holding a steady wireless connection. Unfortunately, it seems Lyric is not one of them. There are widespread reports of people having anywhere from intermittent to major connectivity problems. You have a weak phone signal. If the threshold boundary happens to be in an area where you have poor reception, the message may not get sent. Okay, so it doesn’t work every once in awhile, say 10% of the time. No big deal, right? Here is the problem with that: you can never be sure if it worked or not. Since you don’t know when it’s going to fail, you will constantly be checking up on it. So instead of having a smart thermostat that controls your home environment automatically, you end up with an infant thermostat that you have to babysit. This totally undermines the convenience benefit that is supposed to be one of the main selling points of a smart thermostat. Will Lyric Work For Me? Is Lyric Compatible With My Heating/Cooling System? The short answer is most likely yes. Any type of forced-air system or heat pump system should be compatible. The systems that are definitely not supported are high-voltage (line voltage) systems such as electric baseboard heating and wall convectors. You will need something like the Stelpro Ki thermostat if that’s what you have. Nowadays, it’s not very often you run into a WIFI device that is incompatible with a WIFI router but, apparently it’s possible. The Lyric requires your home router to support a certain low-power standby mode. Honeywell provides a list of compatible routers (scroll down to where it says “Is my Wi-Fi router compatible with Lyric?”). What Other Smart-Products Is Lyric Compatible With? The Lyric can be installed and used with only a WIFI connection. However, most shoppers are looking to build a smart home network that consists of more than just a thermostat and a WIFI router. 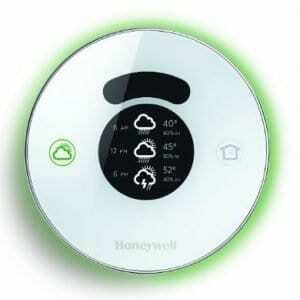 Honeywell provides the “Lyric” line of devices to accompany the Lyric thermostat. The Lyric is also supported by a number of home automation controllers including Apple HomeKit, Samsung SmartThings, Lowe’s Iris, and Wink. This is by no means a complete list. Honeywell is a big company with lots of clout in the industry so support from third party products will only continue to grow. A more thorough (and growing) list of supported products can be found at the Honeywell website. The installation is a relatively simple process. Take off your old thermostat cover and take a picture of where the wires go. Then, download the Honeywell app on your smartphone and let it instruct you on how to connect the wires to the Lyric. If you do not have a c-wire, the Lyric uses a wiring technique that is commonly known as “power stealing.” This means it gets most of its power from the wall, but still requires a battery. Many people have reported problems with this setup. Reports of extremely short battery life and intermittent connectivity are way too common. Until Honeywell fixes this situation I would strongly recommend staying away from this thermostat if you don’t have a c-wire setup. Before it can be a worthy competitor, much less a replacement for the Nest thermostat, it needs some improvements. The lack of a web app, a conventional programming schedule, and energy usage reports don’t help its cause. 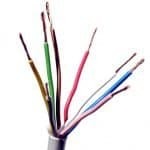 But, functionally speaking, the main issue is the widespread connectivity problem. I think the value of this thermostat would go way up if Honeywell could solve that problem. It is the source of almost all the angry Amazon reviews and for good reason. If this thermostat wasn’t significantly cheaper than its competitors, I couldn’t recommend it to anyone. But, If you can manage to avoid the connectivity problems, you should end up with a nicely functional, modern looking smart thermostat with built-in geofencing support. Plus, you get it at a price about 40% lower than the competition. For that price, it’s bound to attract some admirers despite its flaws. I’m Feeling Lucky…I Still Want To Buy The Honeywell Lyric! The site doe not mention when you wrote this article, but as of January 2019 the lyric continues to be a disappointment. Something that may not be obvious is that it is not able to use the geo fencing and schedules together. It is a one or the other thermostat. They have been promising a fix for the 2 years 10 months we have owned it and as of today they stated that it is a low priority on their list of enhancements. All of the negatives in this article are accurate. A major problem is that you can turn the system off (not program it off, but actually turn it off) and it will show off on the phones, but it will go with the program anyway. This results in a tremendous waste of electricity/gas when you are on a trip. Saving energy was supposedly the point of this overpriced device!